King Ludwig II of Bavaria is one of the most colorful characters in German history. Widely regarded as insane, he was certainly a troubled individual and not well suited to the demands of a monarch’s life. Although as a ruler he was neither effective nor well-liked, he is remembered fondly today primarily because of his contributions to the future economy of Germany: his castles, which attract huge numbers of tourists each year. Of the three castles Ludwig had built, Neuschwanstein was the most famous, with its fairy-tale pseudo-medieval design. But even more ambitious was Herrenchiemsee Castle. At the foot of the Bavarian Alps lies the Chiemsee, a large lake with a number of islands. To reach the largest island, Herreninsel, you take a ferry from the shore. Hidden from view by trees until you reach the island is what appears to be an exact replica of Versailles. And in fact, that was just what Ludwig was after. He didn’t like the thought of being outdone, and fancied himself as one of the great kings of Europe. So he studied Versailles carefully in order to make his version as close as possible to the original. Herrenchiemsee lacks the two side wings of Versailles, has a somewhat different interior layout, and is located in a much more secluded setting. But the overall design of the architecture—and even the choice of artwork, fabrics, and décor inside—reflects the sensibilities of French royalty. It is not always apparent from photographs, but Herrenchiemsee was the largest and most lavish castle Ludwig had built. Construction began in 1878, financed by the king’s personal fortune. Like Neuschwanstein, this castle was never completed. Its structure was built in just a few years, but only a fraction of the interior rooms were ever finished. Visitors are uniformly impressed by the ornateness of the furnishings and attention to detail—gold and marble are everywhere you look. Unless, that is, you look very closely. A great many surfaces that appear to be marble are merely painted, and much of the gold is nothing more than a thin leaf over wood. Ludwig was not known for economy, and it is thought that the faux finishes were more a reflection of the design aesthetic of the time, just as wood-veneer plastic was considered very modern a few decades ago. Ludwig was notoriously shy and reclusive. When possible, he avoided interacting with members of his own government, and though he was an avid fan of music and theater, he always demanded private performances. Such was Ludwig’s passion for privacy that he not only dined alone, but wanted to avoid even seeing kitchen staff before and after meals. (In all likelihood the staff didn’t want to see him either: he reportedly had terrible table manners.) This led to the most talked-about room at Herrenchiemsee: the dining room. Ludwig had an elaborate mechanism designed to lower the dining room table through the floor to the kitchen below so that it could be set and raised into the dining room without any need for the king to encounter human beings. One of the king’s other castles, Linderhof, has a similar arrangement, though at Herrenchiemsee the kitchen is open to tours so you can see the mechanism beneath the table. According to our tour guide, Herrenchiemsee included one more bathroom than Versailles (for a grand total of one). And it is quite an extraordinary bathroom. The circular tub, if you can call it that, is the size of a small pool. Ludwig was known to be an excellent swimmer, but also, in his later years, rather rotund. So the tub (or pool) may have been designed more for the king’s bathing comfort than for exercise. 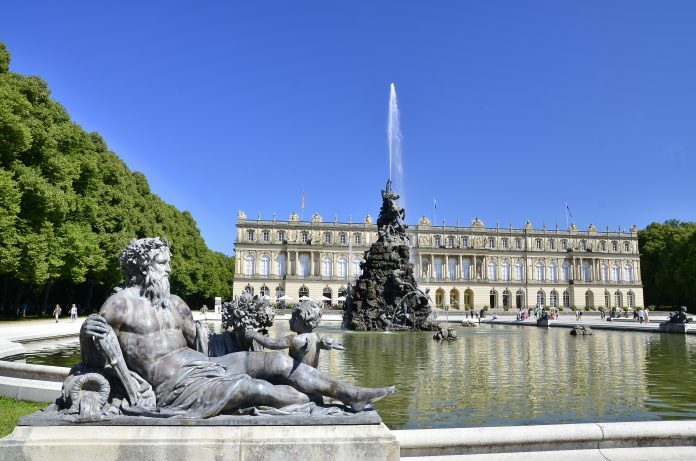 Herrenchiemsee shares another historical trait with Neuschwanstein: despite the huge sums of money spent on it and the years it remained under construction, Ludwig never got to enjoy it. He stayed there for a total of just 16 days in 1885. Shortly thereafter, construction was stopped due to a lack of funds. With three major castles simultaneously under construction and no sense of fiscal responsibility, Ludwig had exhausted his considerable resources and gone deeply into debt. Even though the castles were not funded with state money, Ludwig’s cabinet was deeply concerned about his expensive obsession. They were concerned for other reasons too. He rarely communicated with his staff or attended to matters of state; he had frequent affairs with young army officers; he appeared to suffer from hallucinations and delusions. But more important than all these issues was the rumor that Ludwig was planning to replace his entire cabinet. In order to remain in power, the cabinet members hatched a secret plan to remove Ludwig from power. They had a detailed report of Ludwig’s troubling behavior compiled and signed by a psychiatrist named Dr. Berhardt von Gudden, even though the doctor had never even met Ludwig at the time. According to Bavarian law, the king could be removed from power only if shown to be incapable of performing his duties, and this report served that purpose. In June of 1886, Ludwig was deposed and arrested. Just one day later, while still under custody at Berg Castle, Ludwig went for a walk on the castle grounds, escorted by Dr. Gudden. When the two did not return after several hours, a search began, and the bodies of both men were soon found floating in a nearby lake. Official reports called Ludwig’s death a suicide; Gudden, whose forehead was badly injured, was assumed to have been killed by the king before he drowned himself. However, there is considerable evidence to suggest that both men were murdered by the conspirators who removed the king from power—to be sure he never regained it. Yet another theory suggests Ludwig may have killed Gudden and then died while trying to escape by swimming across the lake. Ludwig’s death, like his life, will always be a mystery. Note: This is an updated version of an article that originally appeared on Interesting Thing of the Day on May 19, 2003, and again in a slightly revised form on August 18, 2004.